July | 2013 | Azazel's Bitz Box. When I started preparing the figure, I found that the truescale nature of it was just going to be far too small for an item in a charity auction. 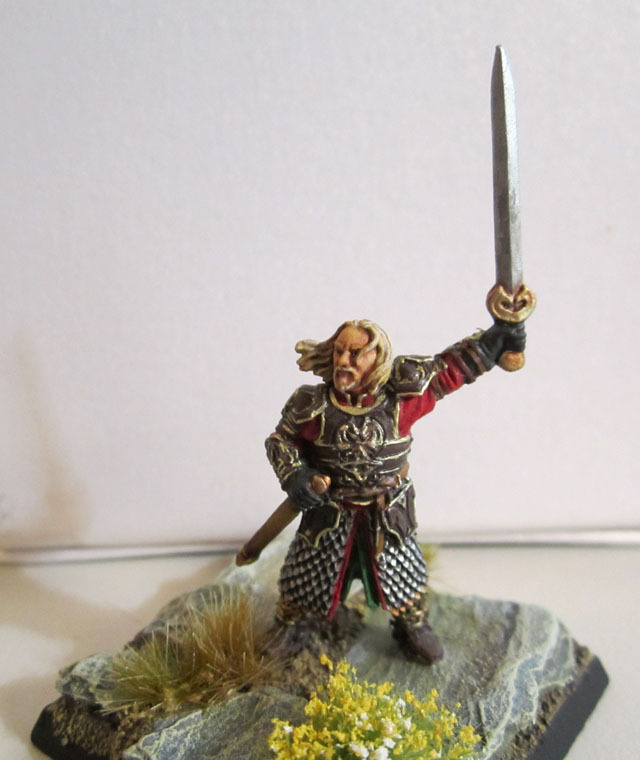 A 25mm round base is fine for gaming, but not quite as exciting for a model purely destined for display. As I don’t have any of those huge and imposing Scibor bases, and didn’t want the base to overwhelm the tiny figure anyway, I went for something a bit larger than the figure, but not big enough to distract. I chose a 40mm “slate” base from Back-to-Base-IX and added some static grass clumps and flowers from Army Painter’s range. I know my mate Cash loves the clumps, referring to them as “sea urchins” and while I can somewhat see where he’s coming from, I like them for larger bases as they give a bit more depth than regular static grass (or indeed, a Reaper “broccoli” base). I only found these photos on my camera yesterday. 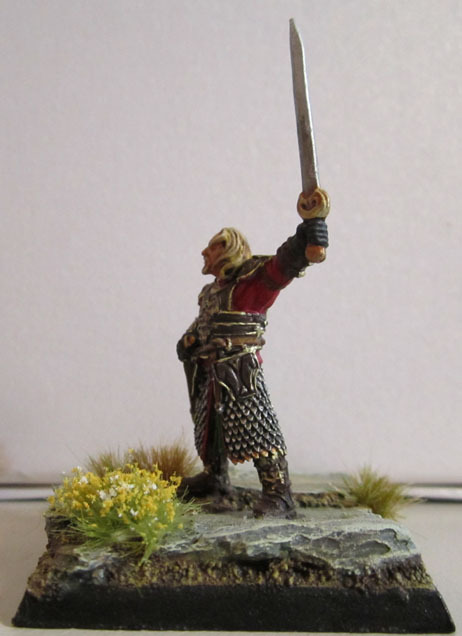 I’d actually thought they were already up here on the Blog, but when I did a search for “Theoden”, nada turned up. 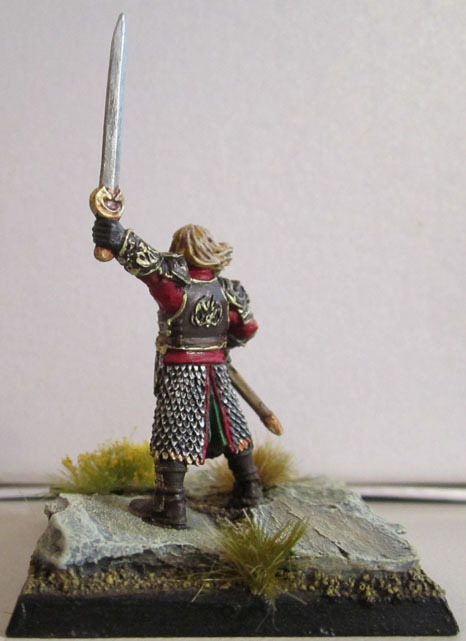 I suppose I painted the figure around the time I was getting prepared and packed up to move, so after getting the model done it was back to work and packing and such at the time. Anyway, done now and months ago sold and given to it’s new owner. Painting the figure was quite the enjoyable process, made moreso by the fact that it only took a few days from start to finish and that the money was going to a good cause. 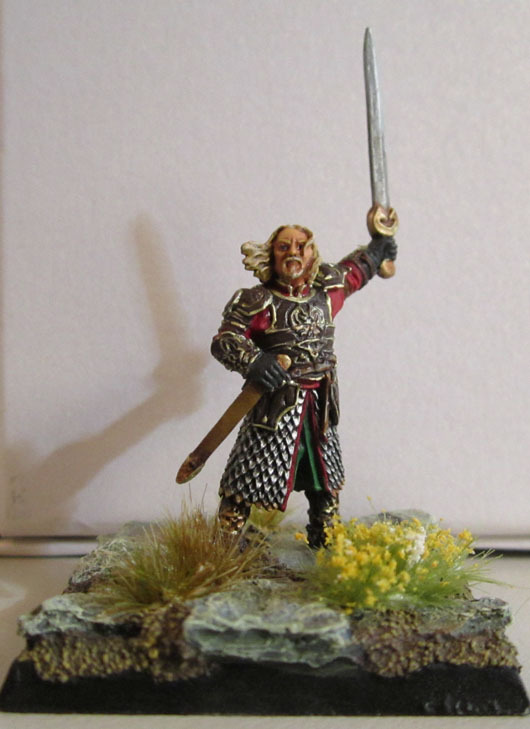 I hadn’t painted a truescale model for some time, either, and the detail on Theoden was surprisingly fine after being to used to predominantly working on the much broader detailed Heroic Scaled figures for so long. 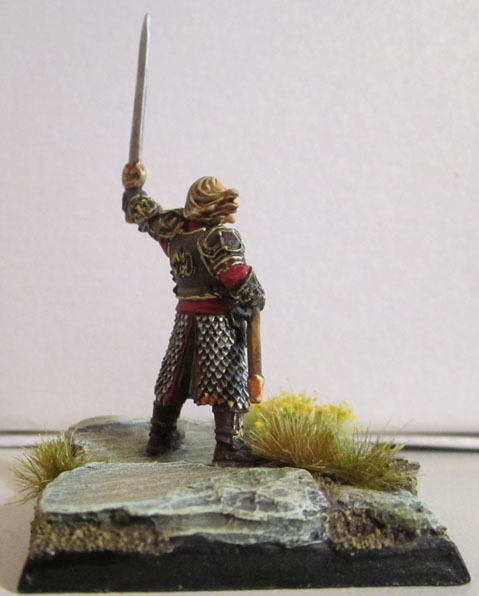 From the Painting Desk #3 – Wardancing the night away! Unusually for my posts, as it happens – is an actual followup on some of the WIP stuff I’ve shown. Well, first time for everything and all that. Here’s what I’ve made progress on in the last few weeks. I’m still battling a nasty winter cold bug, so I haven’t felt like I’ve had the level of concentration to work on the Brettonian Noblewoman or the old Citadel ranger, so I’ve mostly been concentrating on Project: Update. Which is to say going through my old cases of figures and doing some rebasing and touchups on them. So none of these figures are newly painted, strictly speaking. They’ve been rebased, and had some of the weakest elements of the original work touched up as well as chipped paint, etc, but the vast majority of the work is original. The first few Wardancers, rebased and touched up! I’ve finished several of the Wardancers. You probably can’t see a lot of difference between these pics and the original paint shown in the previous post. That’s because I’ve really just wanted to touch them up, but keep the integrity or essence of the original paint, since they were painted in my youth a good 20+ years ago. (now I feel old!) Mostly simple stuff like brightening the metals, a little bit of shading or highlighting here and there, but not going all out. A couple of angles. Early freehand tattoos from 20-odd years ago! 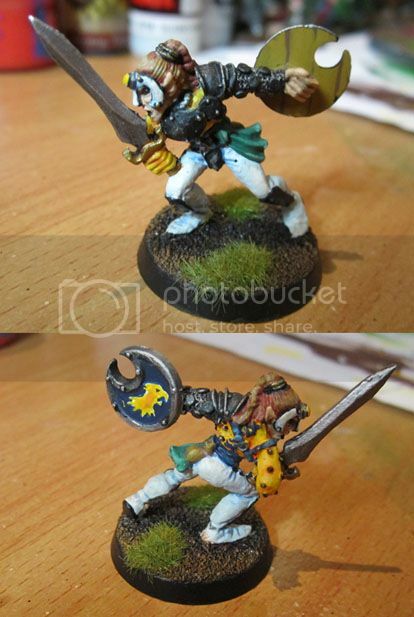 For anyone wondering why these Wood Elf Wardancers are painted in an almost Clownish style, rather than like traditional Wood Elves or like Celts – it’s because shortly after these old models were originally released, the paint scheme in White Dwarf/’eavy Metal showed them in a distinctly Harlequin-esque manner. Since at this stage I was still a teenager, I did what teenagers are supposed to do, and used the WD pictures as a guide on how to paint my models. Except for the chequerboard guy – He was a direct copy (to the best of my ability at the time) of a particularly striking model in the issue. 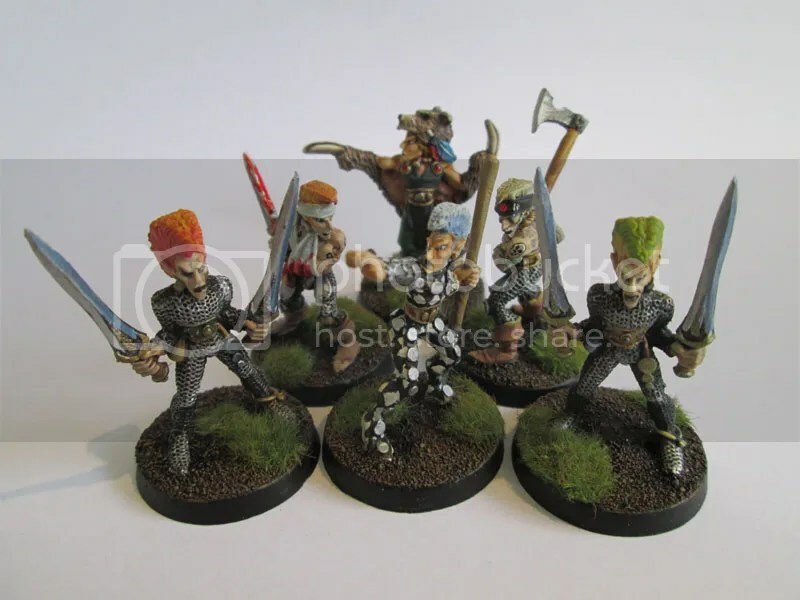 On reflection, I wonder if those gaily-painted Wardancers might have been a specific inspiration for the eventual look and feel of the 40k Harlequins? Wood Elf Beastmaster. Now he just needs his pet! This figure has been bundled in with my Wardancers since the beginning, though he’s not actually one of them. 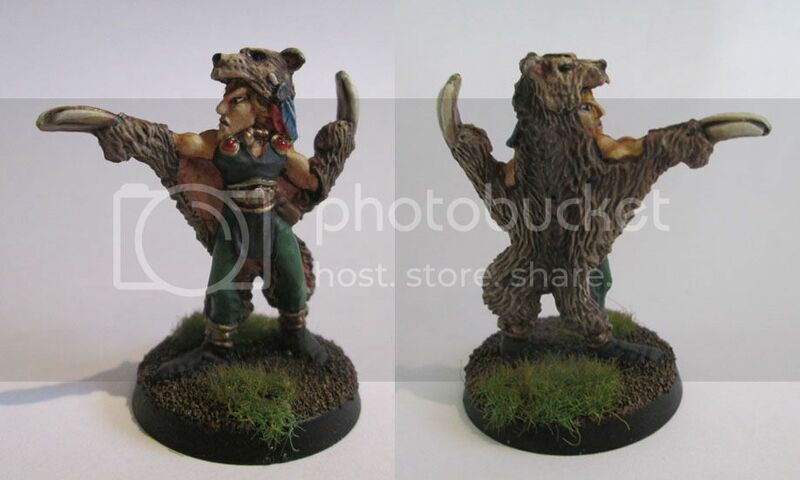 He’s a Wood Elf Beastmaster, and originally came partnered with a large model of a Bear. I somehow ended up with two of said bear, and converted one (with my skills of the day) into a Bear-Centaur using the torso of a Chaos Warrior. The other, I’ve seen floating around in my bits boxes, but probably not for a couple of years, and certainly not since moving at the end of last year. Should I be lucky enough to have it turn up again, I’ll be giving him a trip to the front of the painting queue, mounting him on a 40mm round base, and reuniting him with his master. Should that happen, I’m sure I’ll update the blog with a pic or two. Dark Metal or Light Metal? That’s the question! This guy, I’m not sure how to finish. Originally, I darkened the metal in preparation for the usual highlighting of plate and chain, and found the “blackened iron” look to be a nice surprise – so I left it as is. Now that I’m touching the figures up, I’m not sure whether I should leave it dark, or brighten it up to match his brethren. Thoughts? 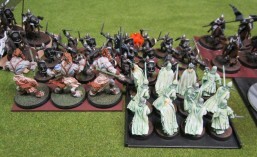 Original Wardancers – Due for an update and repaint! Since managing to finish the first wave of these models, I’ve pulled out the remaining 4 wardancers that I have really not been as happy with in years, so for these four I’m in two minds on whether to overpaint certain sections or strip and repaint. At this stage I’m thinking overpaint on the Native American-themed model, partial repaint on the guy with green boots (new pants or new boots? Suggestions?) A significant re/overpaint for the musician, and I’m really not sure at all what to do with the guy in camo. Obviously, it was kind of a humorous paint scheme, but I’m not sure if the joke really holds up these days. Anyone have any opinions on it? 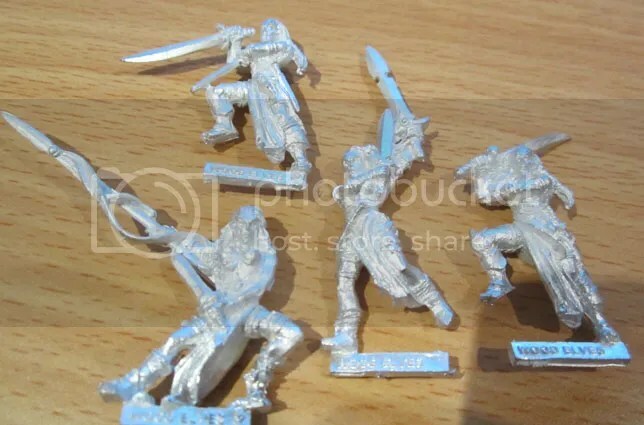 I also came across a few of the more modern Wardancer figures in bare metal that I’d picked up randomly, which I was happy to leave aside for an indeterminate amount of time but now kind of feel like I should paint up, since I’m almost done with their OldHammer brethren. 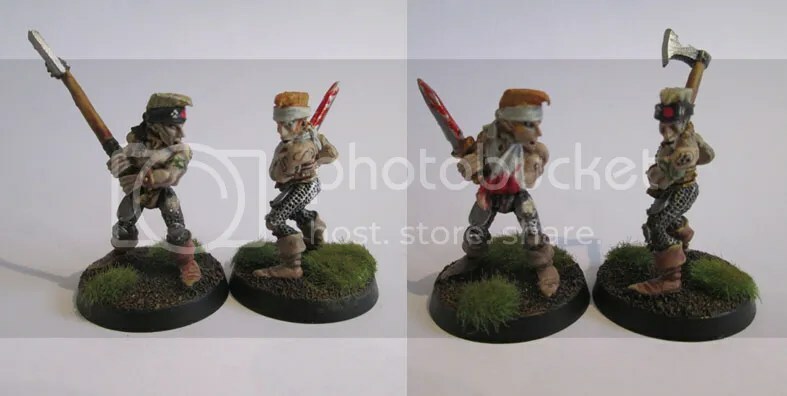 On the one hand, I don’t really want to have these figures queue jump the stuff I’m actually trying to finish – but on the other, obviously the best time to paint these Wardancers is at the same time I’m repainting the other Wardancers. The Gang’s (not yet all) here!